Meet Sonny Miller, a recent college graduate with plans to get her master's degree in psychology. With the intention of resolving some family drama and putting her academic interests to the test, Sonny cleverly invites her mother, Teresa, and her mother's estranged twin, Aunt Melanie, to the quiet and quirky beach house. They both show up...and with surprises of their own. Teresa, a successful opera singer, brings her latest protege, Irina, and Melanie brings along secrets about Teresa and the identity of Sonny's long-gone father. It's time to go back to the beach house with a new set of characters. This time it's a mother-daughter story with summer romances, past secrets and self discovery along the way. The story had many twists and turns that I didn't see coming. There were times when I thought I knew what was going to happen and was delighted to see that the story didn't go in that direction. Serious topics such as eating disorders and kleptomania are discussed but handled in a way that doesn't detract from the beachy atmosphere. I could practically picture it when Sonny enters the house for the first time and sees the beach house in it's delightfully tacky glory. Family issues are the central plot of this storyline. This ranges from Sonny and her mother's relationship to her mother and aunt's relationship and even to Irina dealing with her birth family. I was a little sad not to see any of the characters from Trish's previous novels pop up in this book. I've just gotten used to seeing Kara, Ren, Jeremy and Tiffany all the time and I missed seeing a familiar face. This book is also more romance than the previous books and had less of a chick lit feel. If I had to label it, this would be a contemporary romance book. If there was anything I had a real problem with in this book, it was the use of the extremely short chapters. There would be chapters that were only a page and a half. While this may not be a problem to others, to me it just made the flow of the story keep halting. Some chapters would consist only of a character's single action or thought and didn't really help to keep the story moving along. It felt slightly disjointed to me while reading. This however was a minor qualm. Reading this book made me feel like I was at the beach house myself. I could hear the waves crashing, feel the sun's warmth on me, and just wanted to kick back and relax on the sand and get a tan. This book is perfect for a day at the beach or if you can't make it there yourself, it's the next best thing for a getaway. OOH.... another book with the word "Beach" in the title. I love those this time of year and your review of this book looks good! Thank you, thank you for this recommendation. 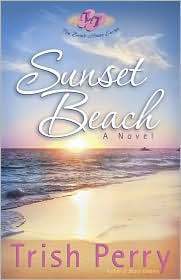 I love beach reads, especially if they really make you feel like you are right there on the beach. I will go out and look for this one!